After pollination, the corn yield potential is set. We can't add to the corn yield potential, but we sure can try to preserve that yield potential! Think of the corn leaves (especially the top leaves) as factories for photosynthesis and their job is to make sugars for plant growth, development and grain yield. If there is leaf loss or stress at tassel or during grain fill, the corn plant may have a reduction in yield potential. Northern corn leaf blight that has spread into the canopy beyond the ear leaf. Earlier in 2016, it was critical that we scouted for fungal disease such as Gray leaf spot and Northern corn leaf blight to make sure it did not spread beyond the ear leaf. Environmental conditions that consisted of rain, humidity, and specific temperature ranges were conducive for disease development. 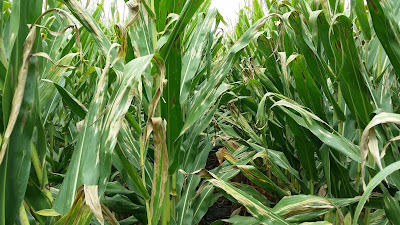 A fungicide application may have been warranted on susceptible hybrids between the corn growth stages of tassel and brown silk (sometimes before dent if warranted) to try to preserve corn yield. It has been well documented that the higher percentage disease on the plant, the greater the yield loss. Research has also shown that if fungicides are applied at the right time, high disease pressure present at that time will increase your potential for a yield response from a fungicide, which can increase your return on investment. There are many other stresses that can occur during ear development that can also cause plants to make less sugars such as lack of sunlight (cloudy days), drought, high plant populations (competition for light/reduced stalk), wind, hail, corn rootworm, corn borer (2nd generation), nematodes, corn planted after corn (higher disease), compromised roots from lack of oxygen (flooding) or root rot, nutrient deficiency (low N/ or high N with low K), high ear placement, or poor hybrid stalk strength. Corn that has shut down due to stalk rots. Unfortunately, corn could have undergone many of these stresses during the current growing season at corn kernel development. The developing ears take priority and the amount of sugars that they require will depend on kernel number. Root and stalk tissue have lower priority, and if under stress, they will receive less sugar and weaken. Hence, in their weakened state, root and stalk rot pathogens lurking in the soil/residue can infect and cause disease. Corn that is infected with anthracnose stalk rot. 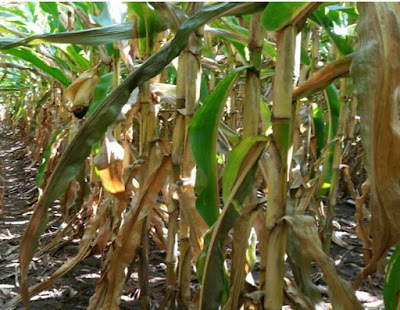 Stalk rot can cause the plant to die within 7 to 10 days, which in turn, causes poor ear fill or finished ears, increased ear rots in wet weather, yield reduction between 5 to 20%, as well as harvest losses. Scout the entire field for stalk quality. Remember that different soil types, soil drainage patterns, hybrids, and fertility can all be factors that could affect stalk quality. Check 10 plants by pinching the second or third internode of the stalk above ground level. Then, push the stalks and if they collapse easily, cut open the stalk to check for disease or insects. Stalk rot could be lurking in just one area of the field or affect an entire field. If more than 10% of stalks appear to have stalk rot, harvest these areas as soon as grain is physically mature with a slow combine speed. All these problems and the USDA has numbers that show we will harvest the second highest corn crop in history. Seems like everything else in Washington, all screwed up. Can you Reduce your Soybean Planting Population?